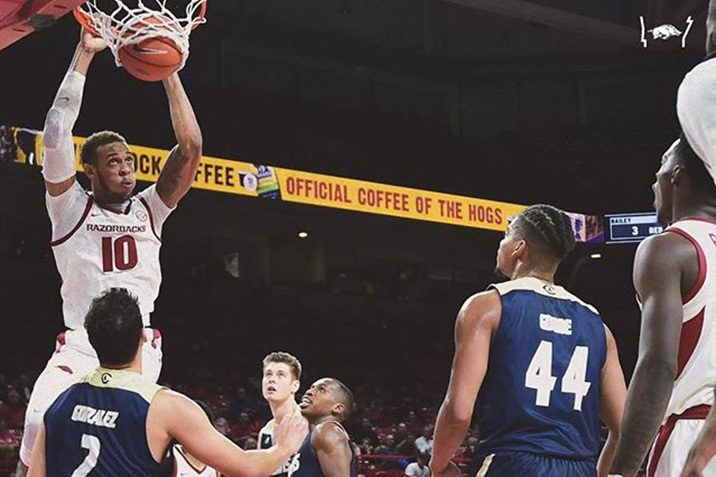 It’s very early in the season, but Arkansas head coach Mike Anderson has to like the way his 2018-19 Razorbacks are shaping up. His Hogs (1-1) had their way with a determined and physical University of California Davis basketball squad Monday night, eventually wearing down the Aggies for an 81-58 victory. It was a solid performance and a good way to bounce back after suffering a difficult 73-71 overtime loss to Texas last Friday in their opener. There’s no comparing the Aggies to the Longhorns in terms of talent, but UC Davis came to Arkansas determined to let the Hogs know they had been in a game. The Aggies played hard and scrappy if not a little bit chippy. To the young Razorbacks’ credit, they played through the physical play that at times has bothered some Anderson teams of the past. Again, it is early, but it is good to see a tougher mentality with the Razorbacks. 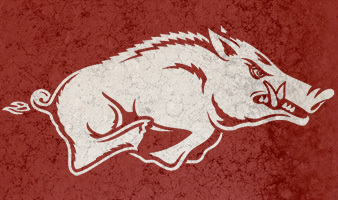 It appears this Hog squad won’t be another that relies mostly on its offense to net a victory. Anderson had to live with some defensive deficiencies in his guard play in recent years, but with a nearly complete turnover in personnel in the backcourt this season, it appears some of Anderson’s “piglets” don’t mind sticking their nose into the fray on the defensive end. While Davis’ talent level has to be taken into considerations, the Hogs ate up the Aggies in nearly all phases of defense. Arkansas held UC Davis to 32.1 percent shooting from the field, forced 24 turnovers, made 10 steals, and blocked 6 shots. The Aggies did outbound the Razorbacks, 36-31, which could become problematic in the future, but the Razorbacks more than made up for that discrepancy in the turnover department with a plus 10 margin. The Hogs did all of that with their preseason All-American Daniel Gafford playing OK, but not putting up dominating stats. Gafford had 12 points, 4 rebounds, 4 blocks, and an uncharacteristic 6 turnovers while facing double teams from the Aggies most of the night. Sophomore transfer Jalen Harris did a nice job containing Aggies standout guard TJ Shorts II. Shorts led the Aggies with 14 points, but it took him 12 shots to get them and along the way Harris and the rest of the Razorbacks forced the talented guard into 7 turnovers. That’s the type of on-the-ball and team defensive performance that has been missing from the Razorbacks’ repertoire for too long. With Gafford being the focal point of the Aggies’ defense, other Hogs made up the difference with the solidly built sophomore Mason Jones leading the way with 21 points and 8 rebounds. Junior Adrio Bailey scored a career high 20 points and made his first-career 3-pointer. Freshman Isaiah Joe added 14 points, giving the Hogs four players in double figures. Keyshawn Embery Simpson added 7 off the bench. While a 65.9 percent shooting percentage from the free-throw line isn’t anything to shout about, it is improved from the Hogs opener. Arkansas hit 27 of 41 free throws after starting off 3 of 10. Gafford hit 6 of his 9 charity tosses which is a solid rebound from going 4 of 9 in the loss to Texas. The one sleight area of concern is the bench play for the Razorbacks. 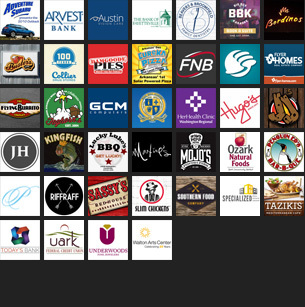 It’s a long season for the pace the Hogs like to play at. All of Arkansas’ starters played 26 or more minutes in a blowout victory. No doubt Anderson would like to get a bit more form his bench, and it will likely happen as his young players adjust to playing his brand of basketball. The Hogs have nearly a week to hone their game before hosting the Indiana Hoosiers for a marquee matchup at 2:30 p.m. Sunday on ESPN. Under second-year coach Archie Miller, Indiana has started the season at 2-0 with a 104-55 victory over Chicago State and an 80-35 win over Montana State. The Hoosiers play Marquette at home Wednesday in a key game before making their way to Fayetteville.